1. What is ChiroThin™ and how does it work? The ChiroThin™ nutritional support formula, by ChiroNutraceutical, our manufacturing arm, is a natural dietary supplement that has been purposefully designed to go hand-in-hand with the doctor supervised ChiroThin™ Weight Loss Program. It contains a host of nutritional ingredients that are well known to aid in fatty acid transportation, fatty acid metabolism, blood sugar stabilization, increase in metabolism and detoxification. When combined with many healthy 'whole' foods in specific amounts and blends of low glycemic index, anti-inflammatory foods, your body will be more efficient at converting stored fat into energy. In general, ChiroThin™ allows the body to more efficiently metabolize fat and uses it as energy when an individual consumes less calories than they burn in a given period of time. ChiroNutraceutical has specifically designed the ChiroThin™ formula to include specific amounts of amino acids, vitamins and cell salts for additional added benefit. 2. Where is ChiroThin™ manufactured and what are the quality control guidelines? In order to maintain the highest ingredient and manufacturing standards, all of ChiroNutraceutical's products use only United States and Canadian derived, harvested and combined ingredients. Our manufacturing facility, which is located in the western United States, is FDA certified. This means that with ChiroNutraceutical, routine inspections by the FDA ensure compliance with current Good Manufacturing Practices (cGMPs) and the Code of Federal Regulations (CFRs) for your safety. Unlike many companies, ChiroNutraceutical holds its own individual FDA Establishment Number. All products manufactured in Canada are Health Canada Approved with NPN Numbers. 3. What sets ChiroNutraceutical's product apart from the rest? Unlike lower grade products, you will not find this product being sold online or by other companies. We have worked with our formulation team to create only top-shelf nutritional dietary supplements. We do not import any ingredients from overseas. Like our other nutirional products, the ChiroThin™ nutritional support formula is proprietary and uses nothing but high grade ingredients. Our unique formula has many advantages like added natural appetite suppressants, energy supplements, detoxification, lean muscle protection, and more. This proprietary formulation was designed to optimize the ChiroThin™ Weight Loss Program to the fullest. Patients frequently report to us that they feel much better and have less hunger issues while taking the ChiroThin™ formula than when they had tried other weight loss programs. That being said, our ChiroThin™ nutritional support formula has the highest quality and desired effects. 4. What is the difference between ChiroThin and Prescription HCG? Prescription HCG (USA) is usually pure pharmaceutical grade HCG with no supporting elements to help it perform. Prescription HCG can be very effective but must be obtained and monitored only by a licensed medical physician. This makes it very expensive as well as being against the law to possess it without a prescription. Pure HCG is usually administered by injection only. ChiroNutraceutical's ChiroThin™ nutritional support formula is a blend of very specific ingredients including amino acids, vitamins, and cell salts and is designed to help your body function better. When used for improved health or as part of the doctor supervised ChiroThin™ Weight Loss Program, along with dietary and behavioral changes, it is safe, effective and affordable. 5. Is ChiroThin safe for men? 6. Will my metabolism slow down if I am on a very low calorie diet (VLCD)? It is true fact that when dramatically cutting back on calories, our body stores fat and our metabolism slows down. This is what is referred to as "starvation mode" and occurs because the body wants to preserve itself and stores the most calorie dense material, which happens to be fat that can provide 9cal/gm for energy. By the way... carbohydrates and protein provide 4cal/gm, while alcohol provides 7cal/gm for energy/body function. A pound (454gm) of 'pure' fat stores approximately 3500 calories, which when metabolized/burned especially during exercise, will provide additional calories to augment those from your approximate 2 pounds/1 kilogram of high-quality nutritious daily food consumption while taking the ChiroThin™ spray formula, for body energy and other life-sustaining physiological processes. When very specific dietary/behavioral changes are used in conjunction with the ChiroThin nutritional support formula, the body will more easily perform the process of fatty acid transportation and metabolism. This will aid your body in mobilizing and utilizing fat to give you the calories that are needed in addition to your daily consumption of food. The ChiroThin nutritional support formula, when combined with doctor supervision and a specific blend of high-quality low glycemic index and anti-inflammatory foods, will help to keep the body from going into a starvation mode by allowing excess body fat to be more easily burned on a daily basis. Adherence to the specifics of the ChiroThin™ Lifestyle Program is essential for optimum results to be obtained. 7. Wouldn't I lose the same amount of weight eating a very low calorie diet? While a person will lose weight while on a VLCD without the additional nutritional support provided by the ChiroThin™ formula, the body will rapidly go into "starvation mode". Starvation mode is a protective function of the human body. When an individual consumes fewer calories than they normally consume over a prolonged period of time, the human body will actually slow down the metabolism, start burning muscle for energy and attempt to store any fat that is consumed. This is extremely unhealthy and will only cause a massive 'rebound' weight gain when the VLCD is discontinued. Additionally, an individual should never attempt a VLCD without health provider supervision. 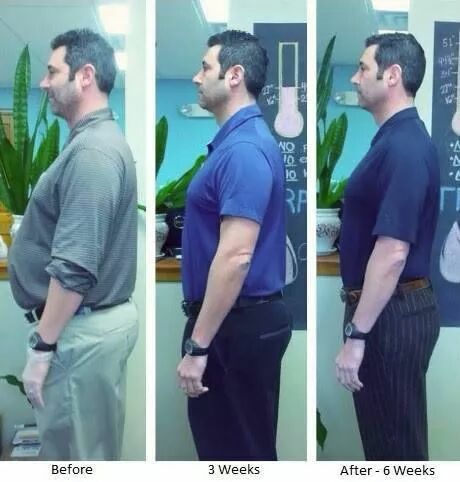 By using the ChiroThin™ Lifestyle Program as described in combination with a specific blend and portion of high-quality low glycemic index and anti-inflammatory foods, the body will be more effective at fatty acid transportation and fatty acid metabolism, which will bring you to your target of weight and more importantly... the loss of fat and inches. 8. Will I get hungry? While it is common to feel mild hunger during the first few days, this sensation will usually stop after 4-6 days. By the end of the first week you will find your servings to be satisfying. This is because the 'ChiroThin™' Proprietary formula is specifically blended with additional ingredients to aid in blood sugar stabilization as well as natural hunger and craving suppressors. So even though you are taking in fewer calories, your body is being given the substances it needs to more easily access the energy you have stored in fat cells. Drinking 80-120 ounces of water per day (4 - 500ml bottles) will additionally act as an extra hunger suppressant and help keep your energy level high. As a "rule of thumb", the average person on ChiroThin™ has plenty of energy and generally feels great while on the program. 9. Will ChiroThin interfere with any medications I am currently taking? What about birth control pills or Depo-Provera injections? The ingredients of ChiroThin™ have not been shown to interact with any medications, including birth control pills or Depo-Provera. Even though there are currently no clinically proven side effects to the ChiroThin™ spray formula, as with any diet, we do recommend consulting with your medical physician to make sure the doctor supervised ChiroThin Weight Loss Program is appropriate for you. 10. Will I experience any changes in my menstrual cycle taking ChiroThin™? Because ChiroThin™ does not contain HCG, there are no changes to your menstrual cycle. Likewise, ChiroThin™ will not affect your ability to become pregnant, nor will it increase your chances of getting pregnant. It is best to avoid starting the ChiroThin™ Program if you are within 5-6 days of your menstrual cycle. Wait until after your menstrual cycle is complete to start ChiroThin™. Once on ChiroThin™ and you have a menstrual cycle, you can maintain the diet and continue taking the drops. If you are currently taking fertility medications, we advise against starting ChiroThin™ Program. 11. What about pregnancy and taking ChiroThin™? If you are pregnant do not take ChiroThin™. If you become pregnant during the program, immediately stop taking the ChiroThin™ spray formula and consult your supervising doctor. 12. How much weight can I expect to lose on the program? While weight loss will vary by person as everyone is different. Many people have and could lose between 20-35 pounds on the 42-day program. Women have been known to drop 2-3 dress sizes while on the 42-day program. Everyone is different. It depends on many factors including how much excess weight you have, how much weight needs to be lost, and your adherence to the 'ChiroThin™' Lifestyle Program. 13. Does the weight loss slow down after the first two weeks? Many times there is a large amount of weight loss in the first week, then a gradual slowing of weight loss. This does not mean that your weight loss has stopped. Typically, inches are being lost continuously while on the program, and after a period of time, patients will experience another large drop on the weigh scale. Weight loss is thus achieved in this stair-step fashion. 14. Is it OK to skip a meal or protein at one of my meals? NO!!!!!!!!!!!!! Never skip any of your meals! It's important to eat all of your allotted food for optimal results. It is especially important that you consume the full portions of protein. Additionally, do not move portions of food from one meal to the next or as a snack to be used between meals. 15. Can I exercise daily? While on the ChiroThin™ Program we only recommend light exercise if you desire. Twenty (20) minutes of low intensity walking is acceptable. We simply ask that you give us 42 days with minimal exercise. Once you are done with the 42 days, we strongly encourage exercising. When exercising, the body burns calories more efficiently. As mentioned above (FAQ #1), stored fat provides 9cal/gm, both carbohydrates and protein provide 4cal/gm while alcohol provides 7cal/gm for energy/body function. A pound (454gm) of 'pure' fat stores approximately 3500 calories for energy, which when metabolized/burned especially during exercise, will provide additional calories to augment those from your approximate 2 pounds/1 kilogram of high-quality nutritious daily food consumption while taking the ChiroThin™ spray formula, for body energy and other life-sustaining physiological processes. Because the body is not able to metabolize fat as fast as it is burned with exercise, you have a significantly greater chance for injury due to rapid onset fatigue. In these cases, extra protein is added to the program. Once you are done with the 42 days, we strongly encourage increasing your exercise regime as tolerated. 16. Do I have to take vitamins while doing this diet? While ChiroThin™ contains B12, we recommend CN-B12 if you are interested in additional metabolism boosting, energy and nervous system function. CN-B12 is formulated by ChiroNutraceutical and is designed to fit hand in hand with the ChiroThin™ dietary supplement. Just like the ChiroThin™ formula, it is sublingual for maximum absorption. For multivitamins, we recommend Ultra-Vite (USA only), which is manufactured by ChiroNutraceutical and is also designed to meet your nutritional requirements. Ultra-Vite is whole food based, certified organic, certified vegetarian and a gluten free multi-vitamin/chelated mineral complex that is designed in a prolonged release fashion. 17. Is it normal to get a headache during the first week? Some people may experience light headaches during the first week. It is most often due to the fact that your body stores its toxins in your fat cells and when the fat cells are used for energy, the toxins are released into your body. If you experience headaches, increase your water consumption and mention to your supervising doctor that you are experiencing headache symptoms. 18. Can I take the ChiroThin™ spray formula longer than 42 days if I want to keep losing weight? Yes! However, after 42 days, you need to enter into the "Maintenance/Cycling Phase" for a minimum of 3 weeks. This is done to make sure that your body does not adapt to the ChiroThin™ formula. 19. Can I Drink Alcohol While Taking ChiroThin™? We strongly recommend that a person not consume alcohol while on ChiroThin™. Some ChiroThin™ users whom have been drinkers or even those that are borderline alcoholic, do surprisingly well on the ChiroThin™ Program. If the simple instructions are followed correctly, the ChiroThin™ Program will get them out of their drinking routine. These users have even said that they don't even feel the need to drink alcohol while on the ChiroThin™ Program. 20. Can I Wear Makeup? Unlike traditional HCG programs, the answer to this question while on the doctor supervised ChiroThin™ Program is "yes". However, avoiding lotions, moisturizers or liquid make-ups with oil may improve the weight loss. You can use any mineral makeup, pressed powders and oil free foundation. Eye makeup and lipstick are okay. Try to avoid lip gloss and Chapstick. If your lips get dry we recommend the use of Carmex. If a body moisturizer is needed, it is recommended that you use baby oil. Most of our clients find that, because they are eating a healthier diet and drinking more water, they no longer need to use lotions. If a person needs to use lotion or moisturizer, we recommend Neutrogena oil-free products as well as Corn Huskers oil-free products. For sun block, we recommend '3rd Rock Sun Block'. It blocks both UVA and UVB. It contains jojoba oil, trace olive oil and carrot oil. One of the main benefits of this sun block is that it does not contain any endocrine-system inhibitors. Since most OTC sun blocks are endocrine-system inhibitors, their use will directly affect a person's weight loss. process or outcomes of the ChiroThin™ Lifestyle Program. Future and prospective clients are encouraged to research for themselves all information regarding various weight loss programs and recommend to discuss their concerns with their physician before beginning any calorie restricted and/or exercise lifestyle program.